Meatball and Italian Sausage Subs make for a super satisfying meal, sliced spicy (or mild) sausage and tender meatballs wrapped in a soft hoagie that’s been slathered with pesto. Topped with a rich marinara, smoked provolone, Grana Padano, a sprinkle of fresh herbs and then toasted until golden brown with bubbling melty cheese. Our full-bodied marinara is easy to get on the stove, the secret is allowing it to cook down so the flavors blend and become one. Keys to imparting BIG TIME FLAVOR into our Marinara! Note: We are not browning the meatballs, shocker I know! They cook in the sauce and impart righteous flavor! We allow the meatballs to poach in the sauce and cook gently. However, we brown the Italian Sausage! Toss those puppies into a hot saucepan and let them brown about 3-5 minutes a side. The minute you put them in they’ll become stuck to the pan once browned they release easily, turn and repeat the process until your links are golden brown. Remove and set aside. Use the drippings from the browned sausage to sauté the onions, red pepper flakes, crushed garlic, and tomato paste. Only takes about 5 minutes. This will build flavor step by step, developing a rich sauce. See full directions below. What’s the secret to great meatballs? So we‘ll make a Panade. A Panade is a bread and milk mixture, it‘s a super simple technique that results in ultra tender meatballs. Buttermilk, milk and evaporated milk can all be used interchangeably, here we use buttermilk it adds a nice depth of flavor and cuts the fat of the meat. Panade is basically a starchy thickener that creates exceptionally tender meatballs, meatloaf, and hamburgers. Created by soaking bread in buttermilk or milk and then mashing it into a fine paste. 2 slices of white bread, crusts removed and torn into 1/2 inch pieces. Tear the bread into small pieces and pour in the buttermilk, allow to soak for 15 minutes (prep your other ingredients while the bread absorbs the buttermilk), then mas into a fine paste. TIP: Be sure not to over blend the meatball mixture! I always mix with my hands, you can always wear disposable gloves if desired. Hand mix until everything is just incorporated. Over mixing causes many a dense meatball! Pesto Meatball and Italian Sausage Subs make for a super satisfying meal, tender meatballs and sliced spicy (or mild) Italian Sausage wrapped in a soft hoagie that’s been slathered with pesto. Topped with a rich marinara, smoked provolone, Grana Padano, a sprinkle of fresh herbs and then toasted until golden brown with bubbling melty cheese. Heat a heavy-bottomed saucepan over medium-high heat. Once hot, add olive oil and reheat 30 seconds. Add Italian sausage and brown allow to brown on all sides. Once browned remove from pot and set aside. About 10 minutes. Add the onion and red pepper flakes, stir with a flat-bottomed wooden spoon. Cook for about 15 minutes carmelizing the onions until golden in color, Toss in the crushed garlic and cook for 30 seconds. Add the tomato paste and cook until it begins to brown about 30 seconds. Carefully pour in the red wine to deglaze, stirring to lift the browned crusty bits from the bottom of the pot. Add the diced tomatoes, crushed tomatoes, basil leaves, oregano leaves, Kosher sea salt and freshly cracked black pepper to taste. Stir and bring the sauce back to a bubbling simmer, add the sausage back to the sauce and cover. Reduce heat to medium, so you can hear a gentle bubbling. Take the crusts off of the white bread and tear into small pieces, add the buttermilk and mash up and allow the buttermilk to absorb. Once absorbed mash again until a paste is created. Place the bread, ground chuck, ground pork sausage, red wine, eggs, shallots, garlic, basil, Italian seasoning, Parmesan, Kosher sea salt and freshly cracked black pepper. Mix by hand until just combined. Place the meatballs into the simmering sauce 1 at a time. Allow the sauce to return to a simmer, and cook, partially covered. Let the meatballs to rest undisturbed for 25 minutes before stirring. When the meatballs rise to the top, stir gently. Simmer, partially covered, stirring occasionally to prevent the sauce from sticking to the bottom of the pot. Allow the sauce to cook down at least 1 hour, the longer the sauce cooks the better the flavors will build. You could easily allow this to cook on low for the day. 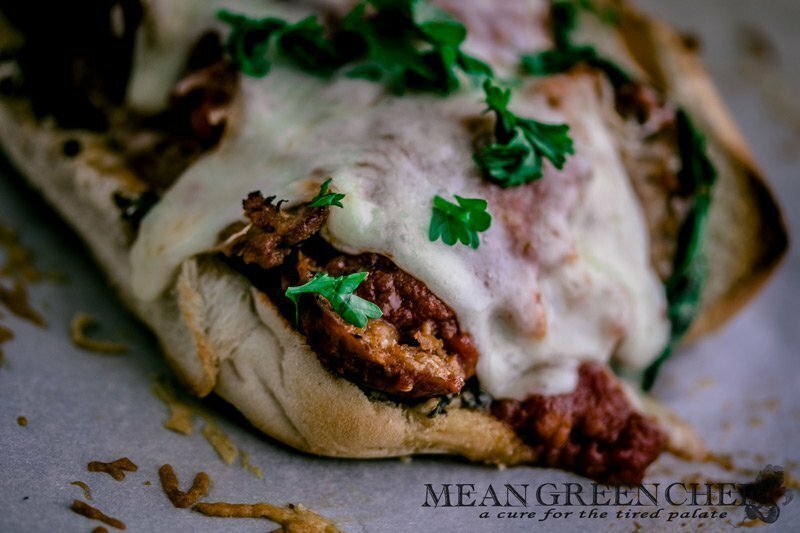 Turn on the broiler, slather the hoagie rolls with pesto (if using), add sliced sausage, meatballs, red sauce, top with smoked provolone and grated Grana Padano or Parmesan cheese. Place under broiler and toast for about 5 minutes, watching to make sure subs don't burn. Store up to 3 days in the refrigerator. Freeze up to 4 months in covered airtight containers or heavy-duty freezer bags. Be sure to check out our Authentic Italian Red Sauce and Easy Egg Yolk Pasta too!